BBVA Compass' Tuck Ross talks Poliwags, Pidgeys, and profits. Pokémon Go can be a game changer for innovative businesses that are willing to play along. Pokémon Go is an augmented reality (AR) game that uses your phone camera and Google Maps to place Pokémon in the world around you. 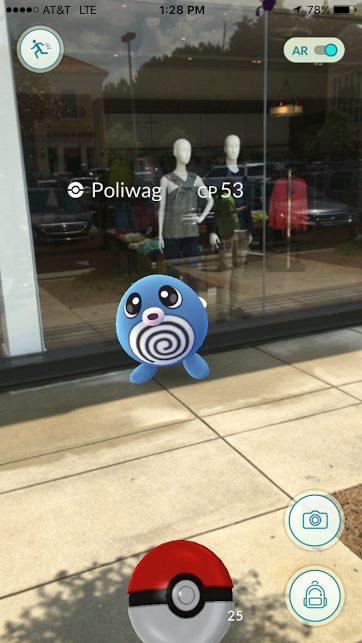 Your neighborhood, a shopping center, or a city sidewalk becomes a playing field for the game, with the goal: to hunt Pokémon, “gems,” and other goodies. Players range in age from elementary school kids to adults, and the only tool required is a mobile phone, making it accessible to a wide swath of society — and potential customers. Pokémon Go users spending an average of 43 minutes per day on the app. Within two weeks of its U.S. launch, Pokémon Go built an audience of more than 21 million active daily users, with more than $1.6 million in daily revenue from in-app purchases. It’s already outpacing Twitter and Tinder in daily active users and WhatsApp and Instagram in usage, with users spending an average of 43 minutes per day on the app. Who knows how long Pokémon Go will capture the national attention, but businesses that take advantage of its popularity now could build customer relationships that outlast the game. Businesses that take advantage of Pokémon Go’s popularity now could build customer relationships that outlast the game. Check your business risk tolerance. People have been injured playing Pokémon Go because players tend to look at the game, not where they are walking (or in some cases driving). Check with your risk adviser and/or business attorney to see if inviting players to your business is manageable and worth it. Download the app to a shared phone. Unlike Facebook Ad Manager, you cannot centralize usage or spend — each app install is a separate instance so you will have to use a single smartphone to run Pokémon Go. Using a corporate phone or a shared team phone could be the best option. Set up your payment method. Make sure your payment method is stored in the app store of the associated phone. You will run promotions for your location via in-app purchases. Determine if you are a Pokéstop. Players search for Pokéstops to score bonus goodies, which help them catch more Pokémon. Businesses can’t choose to be a Pokéstop at this time, but if there’s one at your location, it simplifies the next steps. If you’re a Pokéstop, drop a Lure. A Lure is an in-game tool used to attract more Pokémon and players to a Pokéstop location. Each Lure lasts 30 minutes, and you can purchase as many 30-minute increments as you want. Since Pokémon keep appearing when a Lure is active, you might see players hanging around, waiting for the next Pokémon to appear. What’s the cost? Super low. Here’s the math. With $100 netting you 14,500 Pokécoins, the in-game currency to buy Shop items, and an eight-pack of Lures costing 680 Pokécoins: 14,500 Pokécoins / 680 = 21 eight-packs of Lures = 84 hours of Lures active = $1.19 per hour. Measuring results. Keep track of incremental foot traffic and watch behavior of new traffic (face down in phone with odd turning behavior is a good sign). The ROI here could be significant. Even if you add 10 people incrementally, that’s 19 cents per person. Offer discounts. Reward teams that control Player Gyms nearby for their presence in the area and game participation. Ask players to show their phone for confirmation of the team they have joined in return for a discount. Be a rest stop. Offer your location as a Pokémon Rest Stop. Provide A/C, free beverages, phone charging stations, and/or free Wi-Fi. Once you determine your concept, promote it with storefront signage and a landing page on your website. Tag that page with display retargeting for your mobile app, mobile shopping channel, or products you feature in your screenshots, and make sure to share via social media. Pokéman Go may be a fad, but keep in mind Pokémon was supposed to be a fad 20 years ago and it’s still here. Pokéman Go may be a fad, but keep in mind Pokémon was supposed to be a fad 20 years ago and it’s still here. No marketing channel is evergreen. Pokémon Go has captured national attention in a fun and engaging way — and it’s popular right now. So now is the time to capitalize on it. Tuck Ross is senior vice president for Digital Marketing at BBVA Compass. Ross helped shape digital strategy for Disney, Hasbro, Ergo Baby, and Guitar Center before joining BBVA Compass in 2015. He has reached Level 4 in Pokémon Go.